Here is a big hauler. Emblems removed. Photo from Bill White. Going with Hamish on the HAYES.. Pre War?? What is that unusual turntable / 5th wheel??? Go with the crowd. Hayes. Nice looking rig. Hayes for me as well. Yes, this is a big Hayes alright, a late 1940's model 22-19 60 ton coal truck. This monster was operated by West Canadian Collieries, LTD. 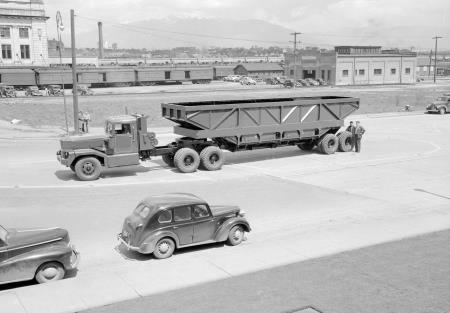 I'm dating this truck by the automobiles in the photo, the newest car I see is late 1940's and several are substantially older. Hamish had this first. Thanks to Bill White for posting this photo to Facebook.